What happens when you put a mad man, his baby, priest and detective together in a rough situation regarding the changes religion requires of people and their inner demons? A bloodbath. When Francis, a devil forced to change by the world around him, takes his own infant son hostage with a gun, Father Anthony and Joseph, a detective, step in and attempt to cool the situation. But, when they discover that he isn’t trying to punish his son for being a ‘devil’, rather protect him for the change he had been forced into by his wife, mother, and church, things quickly escalate into something much more severe. He thinks that devils too should be free to live life as they please, without judgement or reaction. Which has me wondering; how much of a devil can this man actually be? After reading this one-shot comic, I was blown away by the depth they managed to bring to such a short tale. Most of us are born devils, or according to nature as I prefer to see it. We are all based off instinct and society, our friends, and our family show us as we grow older how to live life as an artificial, egotistical angel. This, of course, being the fact that people attempt to live by rules that, for the most part, no longer relate to our lives. Sure we shouldn’t kill one another – that’s bloody common sense – but, in a world gone mad aren’t we all just a little guilty? Aren’t we all part of Satan none the less? His intentions are clear, not to hurt his son but give him hope for a better tomorrow. A new day where he can live without the harassing eyes and tongues of others; a place where he could live life according to his morals and standards, not someone else’s. I can get this, not the whole trying to kill him part, but the idea of it. If we are just told to do these things simply because they are ‘right’ or ‘wrong’ (according to their versions of), that doesn’t mean I’m any less bad. It just means I now know how to stay out of trouble. No one knows who you truly are but yourself, and deep down we all have a little demon hanging out, eating our fears and resentment, building itself up into what many become as they grow old – bitter versions of who they once were, people who regret their decisions because frankly they didn’t do what they believed was right but, what they were told was. I don’t wish that upon anyone. Having grown up in religious schools and after reading the bible a couple times over, I quickly came to the realization that if the All Mighty is kicking around up there, I’m more than sure he prefers kind atheists to harsh, judgemental Christian’s. But, that could be just me. 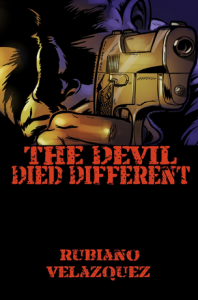 The Devil Died Different was a great comic, exceeding my expectations drastically for a relatively unknown work. It really gets the brain working and has you really question where you stand in this issue and why. A beautiful story of moral boundaries alongside breathtaking art and for free? You best not be passing this one up. 8 changed ‘devils’ out of 10. Give it a go, it won’t take up much of your time and none of your dollars. It can be found here on Graphic.ly.